Carver Grove Apartments are under construction now on Carver Street. The City of Myrtle Beach demolished the old structure on the property to make way for the new Carver Grove Apartments. Myrtle Beach Housing Authority is developing housing for homeless veterans and veterans with disabilities. The eight, one-bedroom apartments will be available June 1, 2018. First floor units are fully mobility accessible. Second floor units include sensory adaptations for veterans with sight and/or hearing impairments. Four units are set aside for homeless veterans under the HUD/VASH program. The remaining units are for disabled veterans. Upon approval, a veteran will pay 30 percent of his/her adjusted monthly income for rent. All utilities (electric and water) are included in the rent. DD-214s are required, and veterans must meet income guidelines. 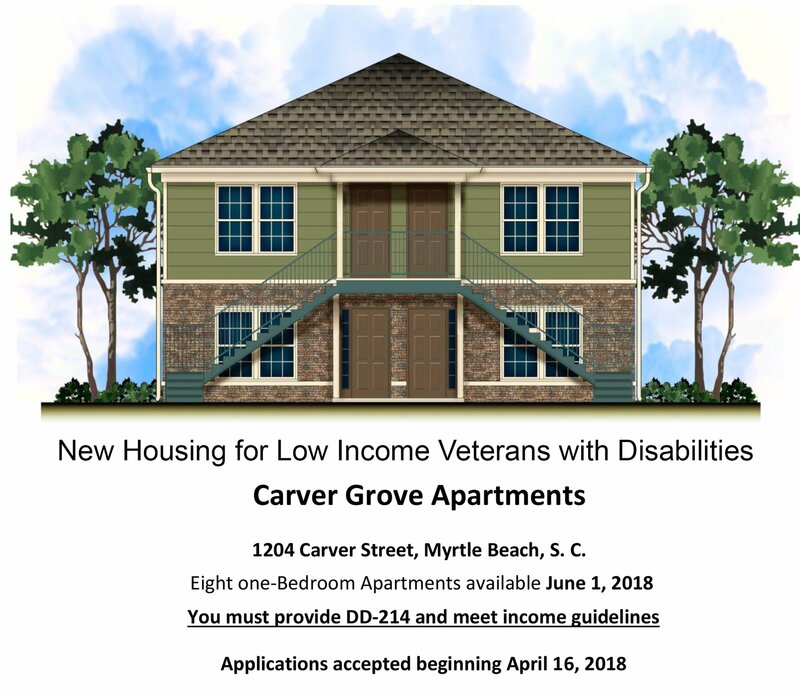 Application are accepted beginning April 16, 2018, at the Housing Authority of Myrtle Beach, 605 10h Avenue North. For more information about the Housing Authority, go to, http://mbhaonline.org/.